Gov. 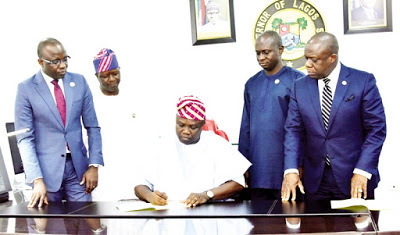 Ambode signs seven bills into law – Royal Times of Nigeria. On Thursday, seven bills were signed into law by Governor Ambode of Lagos State and the most significant of which is the Electricity Power Sector Reform Law which gives legal backing to the Embedded Power Programme. According to the governor, this will help us achieve our electricity generation plan to provide 24-7 uninterrupted electricity supply to Lagosians in line with the vision to attain a non-stop economy and make the Lagos globally competitive. Speaking on the import of the new laws, the Attorney-General & Commissioner for Justice, Adeniji Kazeem, said the laws would further take the dividends of democracy to the people.